Gold Cave Escape info about the game-Games2Rule. 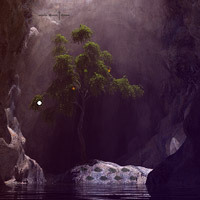 Gold Cave Escape is a new point and click escape game developed by games2rule.com. You hear about a tourist place gold cave, and visit that place. As it was closing time for visitors, unaware about this, you stay inside for a long time. The security thought everyone had left and locks the door. When you want to leave the place, he comes to know that the door is locked. This place looks haunted. So many Scary noises are echoing. Horrible moment for you. You don't know where is way of out from there and no one there to helping you out. It's a great challenge for you. Find some useful objects and hints to escape from the gold cave. Good Luck and Have Fun!